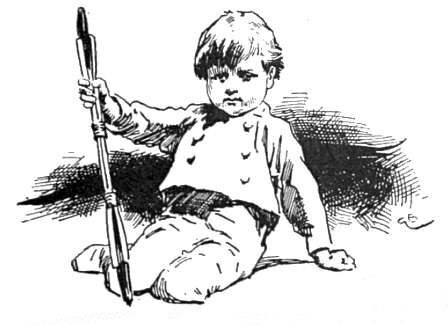 Cute drawing of a little boy in a suit holding a larger-than-life writing tool. I’m not sure what the writing tool is but since this picture was used in a vintage children’s book to introduce the list of illustrations, I’ve assumed that he is actually holding something related to drawing and painting. Regardless of what he’s holding, his little button-down suit and serious expression are just so darn cute. This is one of a number of children’s images drawn by Gordon Browne (1858-1932) which were used to illustrate National Rhymes of the Nursery.